“I’m Cody Pytlak, bringing you this morning’s bird calls for June 1st, 2014. It’s sunrise here in Peace River and the time is 5:08 am. Enjoy the birds!” I shout into the microphone, ten feet away, and for the next ten minutes I sit still in a small woodlot, headphones pressed to my ears, listening to the songs and chirps of birds being recorded by a specialized, high quality audio recorder. Leaves and bushes rustle from the rapid movements of squirrels, ducks fly past in the distance and call out, and tiny songbirds flutter their wings as they fly from branch to branch. Everything is amplified – including the infuriating buzz of mosquitoes as they hover above the microphones. It becomes difficult to determine if the blood-sucking insects are crowding around the recorder, or if they are swarming me in an effort to find a meal. I realize it’s both, and my field partner, Rianne, and I still have a few hours of monitoring to do this morning before we can find safety and sanity inside our work truck. It’s a year of firsts for me: my first time in Alberta, my first field season performing environmental monitoring, and my first time working for the ABMI. 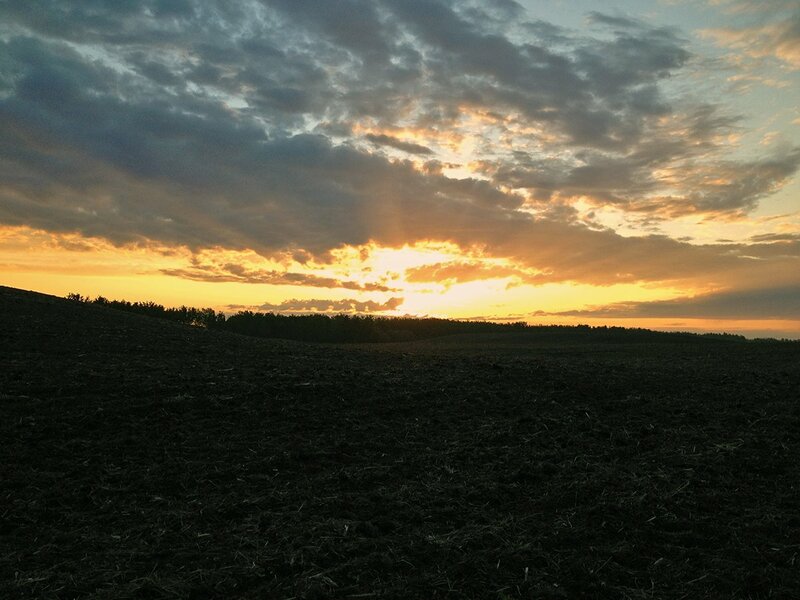 I’m midway through my first spring shift, which means getting out of bed anytime from midnight to 3 am to be in the field before sunrise to record birds. In May, when I arrived in Grande Prairie from my hometown in southern Ontario, I asked returning ABMI technicians about the toughest part of the job. The answers were split between waking up early morning after morning during spring shifts and coping with the barrage of insects in the field. True to their experience, after a week into my first spring shift, I’m finding it a challenge to leave for work when it’s still dark, knowing I have to stumble through fields and forests for hours carrying a backpack full of equipment while dealing with the relentless buzz of mosquitoes near my face. Yet, as tough as it is to wake up in the early hours of the morning, my reward each day is to witness bands of yellow and orange light pierce through the clouds as the sun steadily climbs above the horizon and begins to warm the air and ground. Simultaneously, the chirps and peeps emerging from the trees and tall grass become more frequent, and within a half hour past sunrise the forest and fields are alive with the songs of birds. This is when the job feels less like work, and rather a fun and rewarding way to spend my spring and summer. Sunlight breaking above the horizon as the sun rises and the day begins. As relaxing as watching the sunrise can be there is plenty to be done. Bird surveys are timed, requiring technicians to complete nine ten-minute recordings within six hours of sunrise and the threat of having to re-do the site on a later day if the time limit is surpassed keeps us on our toes when moving from point to point. Most experienced field technicians and co-ordinators agree that birding is the most stressful field protocol that the ABMI does because of the time limit. We take point counts at stations three hundred metres apart – that might not sound far or difficult, but encountering a site with dense thickets of willow and alder or steep terrain can be a curse that slows down the walking pace between points [ABMI Survey Design: The ABMI has 1656 survey sites across Alberta, spaced approximately 20 kilometres apart. Each site has a designated 1-hectare centre and the majority of protocols occur within this 1-hectare grid. Bird protocols extend beyond this, with nine bird counts occurring every 300 metres around a 36-hectare perimeter]. Logs, stumps, and rose bushes leave legs covered in bruises and scratched by thorns, easy reminders that bird surveys are often obstacle courses with another name. And besides these hazards it is also worth remembering there is always the chance of bear and moose encounters. The days of spring don’t end with birding. The remaining spring protocols include taking site photos, collecting soil samples for mite extraction, measuring the amount of down woody material along transects, and recording tree species, as well as height and diameter for those within specific study plots. Both the ABMI terrestrial and wetland data collection are designed to be done by a crew of two, with both crew members able to identify common mammals and birds and at least one with a background in identifying vascular plants. In the case of the spring protocols, typically one partner will do the birding while the other one performs the remaining protocols, and then trees are done together. Rianne and I often switched our duties each day to ease the burden of birding and to get experience with each of the protocols. Stay tuned to Part 2 to read about collecting soil samples and tree data, as well as the experiences that come with it – it’s not every day that you can frighten Purolator employees when shipping samples for work! Written by Cody Pytlak. Photo credit: Cody Pytlak. 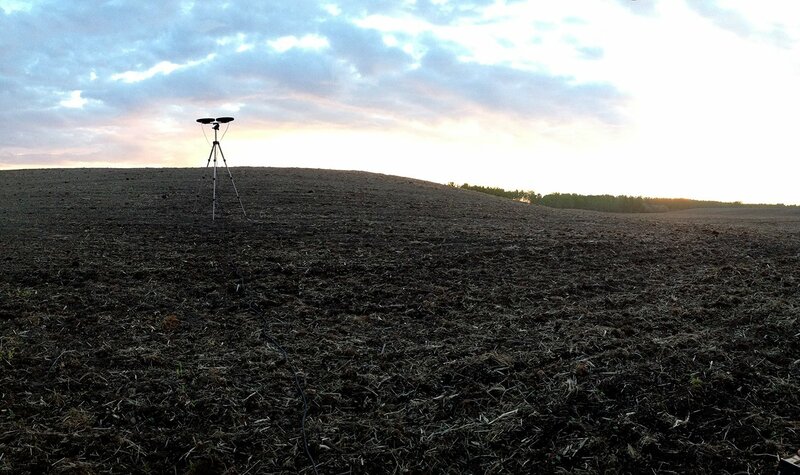 Top photo: Recording birds at dawn in a crop field.